I work in an arts and crafts store. We have crafty, creative, weird, wonderful people. One of them is Jeanette. She is young, wise, brilliant, unique, shaped a bit like a selkie or one of her mermaids, and has insanely long “Princess hair” which I envy. You may recognize Hei Hei from Disney's Moana. 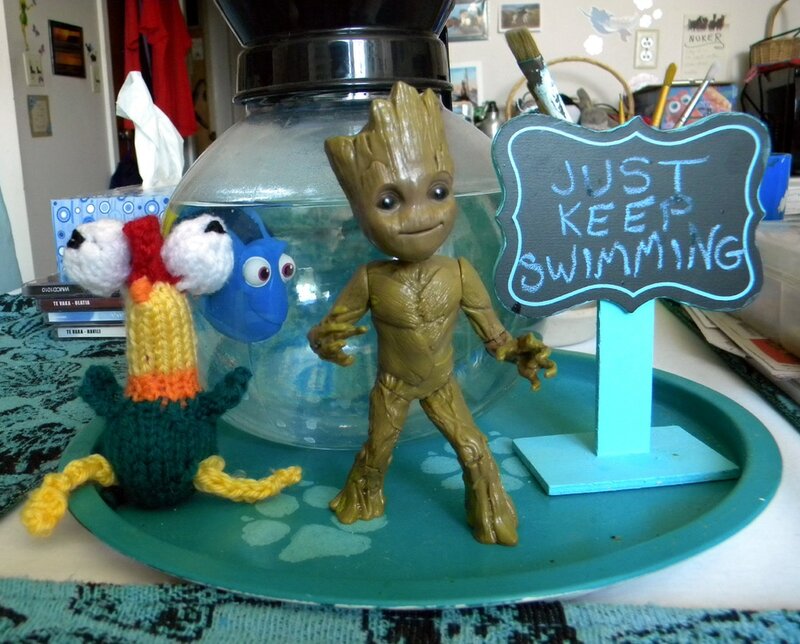 I think the knitted version is even funnier than the CG version. 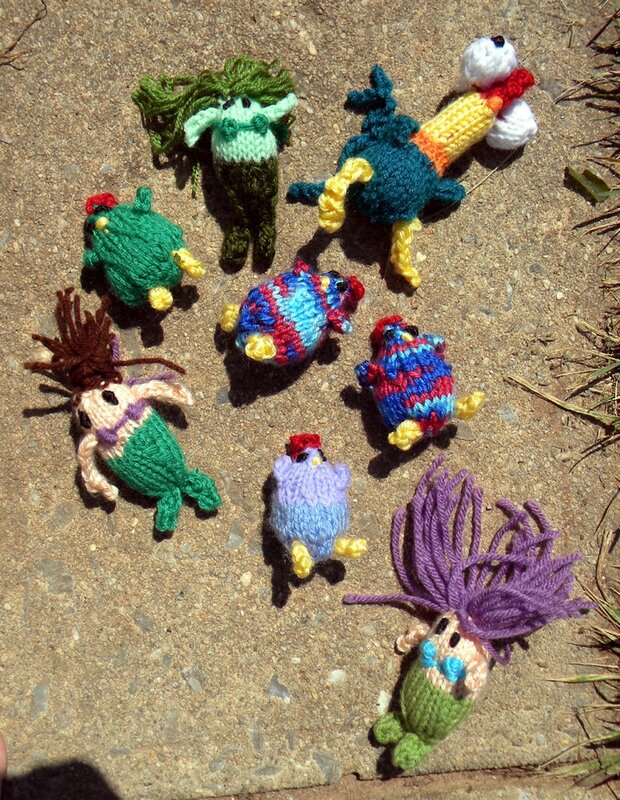 Jeanette also knits mermaids. Not your usual Disney Princess mermaids (though she has done a fabulous Ariel)... these are a bit more edgy, alien, fish shaped... they're somehow a bit more... mermaidy... here they are frolicking in the water garden and in the indoor beach with Legolas, Toothless and Lilo and Stitch... and Spiderman. Awesome stuff. 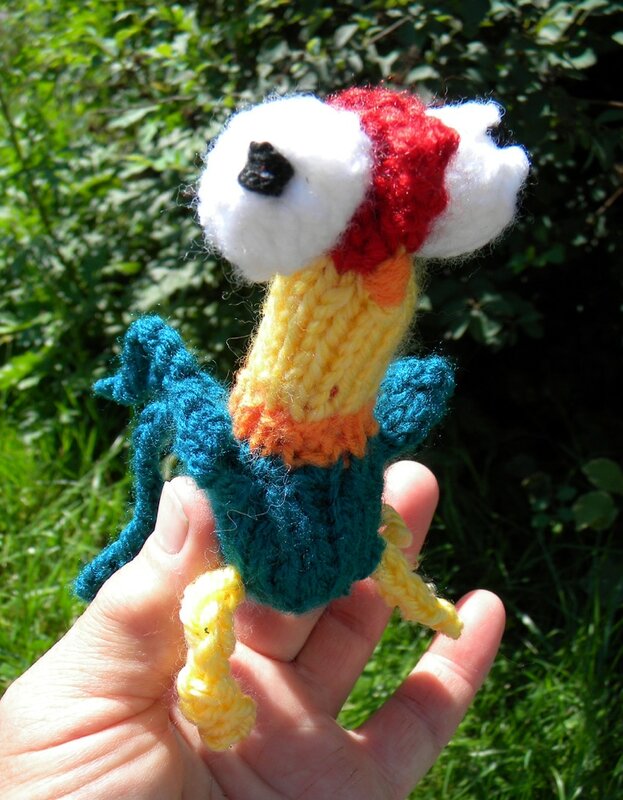 Be inspired to go knit some of your own. 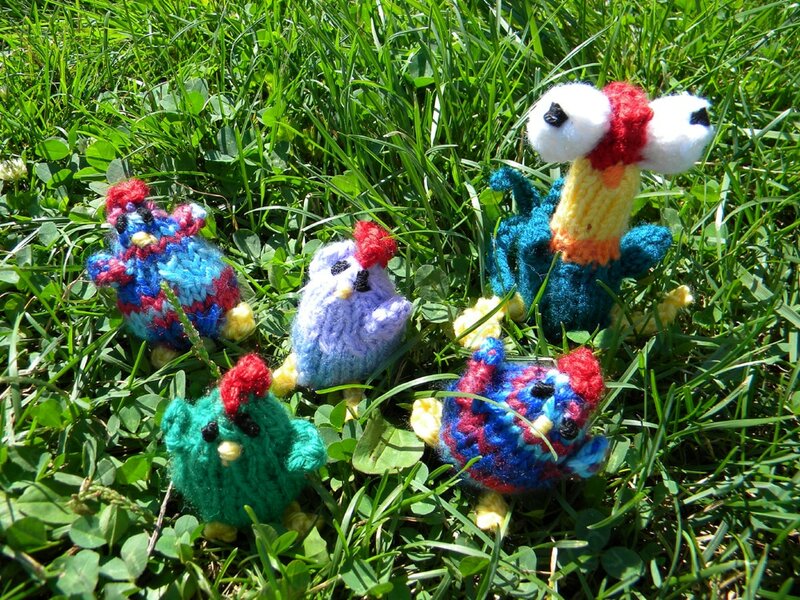 It's a great way to use up random bits of yarn and bring some humor into a bleah day. You don't need to be one of those rich people with the Perfect Yard to create an oasis in yours. All you need is a big plant pot, a horse tub of any size (farm stores, TSC), or kiddie pools. Horse tubs have the advantage of being non toxic and critter safe for sure. No need to dig a hole. Just set out your pools and let them kill some grass (less to mow). a container: this can be a large pot (lotus grow perfectly well in pots if you feed them pond fertilizer), a rubber horse tub (safe for fish, tadpoles and other things that might find your pool), or a kiddie pool (not necessarily safe for fish, they jump out and sometimes the plastic is toxic). plants: SAV, EAV. I found wild lotus seeds, you can buy them, or other plants at your local nursery. I got arrowroot (an emergent aquatic vegetation) at a library yard sale for about $3… everything here seems to be $3. I got mystery “oxygenators” (submerged aquatic vegetation) which looks suspiciously like the invasive pondweed choking our local lake, at the nursery stupid cheap. They sink and oxygenate the water, nice if you’re raising tadpoles or fish. Water hyacinth should be guarded with ninja cows in the south, because if it gets loose there, it chokes waterways. Here in the north it just fills your pool and produces pretty flowers in late summer. Hyacinth floats, likes to be crowded (in fact, won’t bloom unless it is). You’ll need to feed your hyacinths and lotus, unless you have pooping fish… but they like to eat hyacinth. Arrowroot and lotus require pots to be rooted in. You can bring the pots in over winter. Water hyacinths are hard to overwinter, (bring in, keep under light), but you can give it a try. They’re cheap and easy to buy again in the spring. tadpoles: a pond with easy access to frogs and toads will collect eggs, then tadpoles. With enough algae and SAV they can eat, grow and leave when they’re froglings. I saved a few gazillion from a mudpuddle in the pasture. 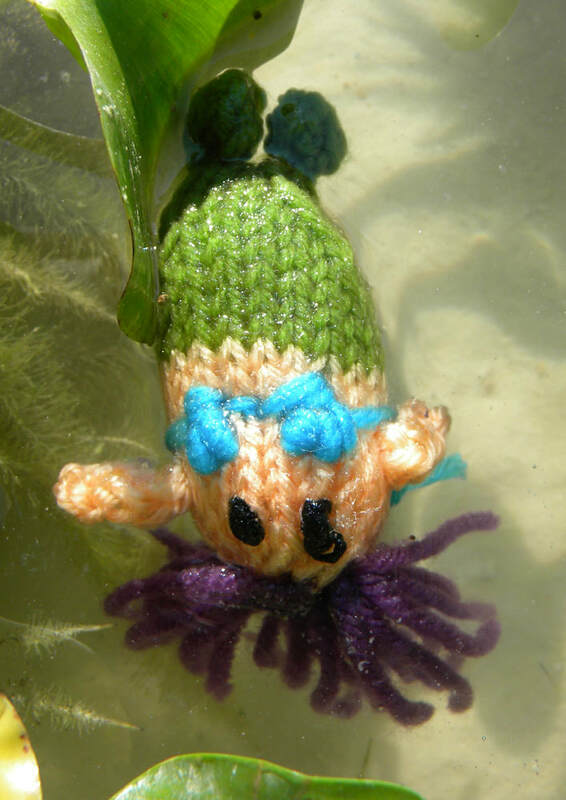 Mermaids float because they are made of nifty floaty yarn and fluffy polyester something stuffing. They also squeeze out and rinse or wash nicely after adventures because of their simple materials and small size (they fit in your hand). Fabulous idea for kids who want to take their tiny friends on adventures!